In April analysts of the Ostrogorski Centre focused on Belarus’ continuing attempts to establish relations with a variety of external actors while further formalising its relations with Russia. 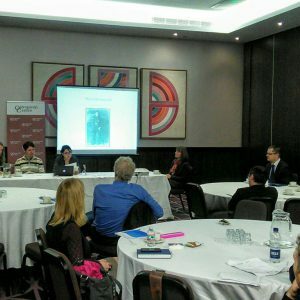 Conference on Belarusian Studies in London. Photo credit: Yaraslau Kryvoi. By signing the agreement on the Single Air Defence System with Russia, Belarus is not deepening military integration but rather formalising the opaque military structures that have existed since Soviet times. Minsk is seeking to normalise relations with its western neighbour, Poland, although the two sides still disagree on more issues than they agree on. The authorities claim that they will take under strict control both pro-Russian and pro-Ukrainian fighters in the Donbass conflict on their return home, but so far they have repressed only those supporting Ukraine. This could lead to the strengthening of pro-Russian groups in Belarus. Freedom House published its report on the political transition in Belarus, prepared by Director of the Ostrogorski Centre Yarik Kryvoi. According to the Nations in Transit 2016 methodology, the reports are written by country experts and country ratings are determined by Freedom House.​ The report noted several improvements but no major changes in the political climate of Belarus. Siarhei Bohdan analysed the agreement on the establishment of a Single Air Defence System between Belarus and Russia. Since the core elements of the system have already been in place for years, the agreement is not a step forward in integration but rather the transformation of the last remnants of messy post-Soviet military structures into a clear bilateral intergovernmental mechanism. Minsk and Moscow are moving further away from the baseline of Belarusian-Russian relations established in the 1990s, a situation in which the Belarusian and Russian militaries were effectively one body, like the Soviet army. Ryhor Astapenia highlighted the recent visit of the Polish foreign minister to Minsk and warming of Belarus-Poland relations. Despite the friendly atmosphere, the visit showed that the two countries still disagree on many issues and significant changes are unlikely to happen in these areas. However, both countries want to agree to disagree and are taking steps towards better relations. Vadzim Smok discussed recent amendments to the law on extremism and mercenaries, and the trials of pro-Ukraine Donbass fighters. The analyst concludes that the Belarusian government seems to be taking a rather unbalanced approach, repressing only supporters of the Ukrainian side. By doing so Minsk risks creating a strong pro-Russian force inside the country, capable of overthrowing an increasingly independent President Alexander Lukashenka at the Kremlin’s order. On 23-24 March the Ostrogorski Centre organised the Belarusian Studies in the 21st Century conference and the Annual London Lecture on Belarusian Studies in cooperation with University College London’s School of Slavonic and East European Studies. It served as a multidisciplinary forum of Belarusian studies, a rare networking opportunity for researchers of Belarus in the West. The conference brought together around 20 speakers from the United Kingdom, Germany, United States, Canada, Poland and France. The conference panels focused on Belarusian history, politics, foreign policy and political science. Selected papers will appear in the new issue of the The Journal of Belarusian Studies. The Ostrogorski Centre launched its new analytical project – Ostro.by. The website focuses on the issues of foreign policy, security and society in Belarus. 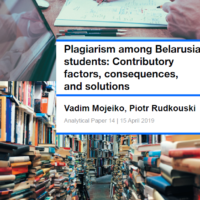 It publishes translations of Belarus Digest articles into the Belarusian language, as well as articles specially prepared for Ostro.by and blogs written by the Centre’s analysts. The authors seek to show the complex issues of Belarusian politics in a simple and understandable form. At the same time, the articles follow high standards of analysis, and provide a balanced and evidence-based view of the political reality. Ostro.by welcomes reprints of its materials with reference to the original source (for online media – active hyperlink). Siarhei Bohdan explained to the TUT.by media portal the reasons why Alexander Lukashenka took part in the Istanbul summit of the Organisation of Islamic Cooperation. Minsk continues to consolidate its ties with the block of conservative Middle Eastern regimes associated with the West. By doing this Belarus is seeking to establish contacts with new economic partners. Yaraslau Kryvoi explained to TUT.by why Belarus improved its democracy score in Freedom House’s Nations in Transit 2015 report for the first time in six years. The interview with Kryvoi was the main news of the day. Website of Belarus-related research thinktanks.by published an interview with the Minsk coordinator of the Ostrogorski Center Vadzim Smok about the new project of the Centre – ostro.by. According to Smok, ostro.by can contribute to improving the quality of the Belarusian media by offering a quality analysis in the form accessible to a wide audience. Ryhor Astapenia commented on Polish radio about the position of Belarus in the Nagorno-Karabakh conflict, the result of 20 years of Belarus-Russia integration, the future of economic relations with the European Union, as well as trends in the field of Belarusian NGOs. Siarhei Bohdan in an interview with TUT.by also commented on the position of Minsk in the Nagorno-Karabakh conflict of Azerbaijan and Armenia. According to his analysis, Minsk is sticking to neutrality and does not want to get involved in any conflicts in the framework of the Russia-led Collective Security Treaty Organization. At the same time Belarus is leaning towards Azerbaijan, which has more weight in bilateral relations. Ryhor Astapenia talked on Polish Radio about the growing role of Minsk and decline of the regions in Belarus. According to the expert, the authorities should develop regional economies with tax, investment and institutional instruments and see it as a policy priority. In an interview with Polish Radio, Yarik Kryvoi commented on the new EBRD strategy in Belarus. The bank will boost investments in Belarus, but only on the condition that the government demonstrates real economic reform rather than its imitation. Ryhor Astapenia summed up the 20th anniversary of Belarus-Russia union at Belsat TV. According to him, Belarus has failed to use the opportunity that two decades of integration offered, as Belarus has not invest money from Russian subsidies in the development of the economy and high technologies. Ryhor Astapenia took part in the panel discussion titled “Belarus: from last dictatorship to World of Tanks”. Astapenia noted that Belarus is undergoing gradual change in many spheres despite the remaining authoritarian regime, and seeing particular potential in development of the IT sector. The discussion was held at the European College in Warsaw. Aliena Arciomenka, Tacciana Vadalažskaja, Andrej Jahoraŭ, Aksana Šeliest. 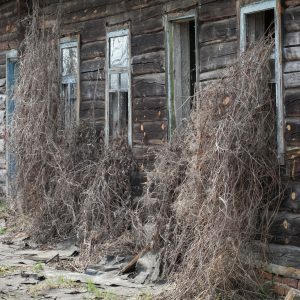 Potential for solidarity in the Belarusian society. CET and BISS, 2015. Maryja Akulava. Gender and the innovativeness of the enterprise: the case of transition countries. BEROC, 2015. Aliaksej Pikulik, Aliena Arciomenka. Shadow economy of Belarus in a regional perspective. BISS, 2015. Maryja Akulava. Macroeconomic performance, individual characteristics and preference for democracy. BEROC, 2014. Maksim Karliuk, Dzmitry Jaraševič. Reduction of administrative burden on Belarus tax system through the standard cost model. BIPART, 2013. Any partner organisation of BelarusPolicy.com can submit its research for inclusion onto the database by completing this form. On 26 April 1986, an explosion at Charnobyl Nuclear Power Plant released huge amounts of radiation into the atmosphere contaminating large territories of Europe. Belarus ended up the most badly affected taking 70% of the fallout from the power plant. The Soviet Union sought to cover up the accident. The news about the explosion came out only two days later, after Sweden registered an increase in radiation levels on its territory. The evacuation of the population in the immediate vicinity of the plant began only several days later. Among the health effects of Charnobyl was a spike in thyroid cancer, especially among children. Among the political effects was growing distrust of the Soviet authorities. In 2006, Mikhail Gorbachev went as far as to call the accident “the real cause” of the Soviet collapse. Although the power plant was located in the Ukrainian town of Prypyac, two thirds of the fallout landed on Belarusian territory. Photographer Siarhei Leskiec documents life in the contaminated parts of Belarus today, thirty years after what is considered the worst nuclear plant accident in history.